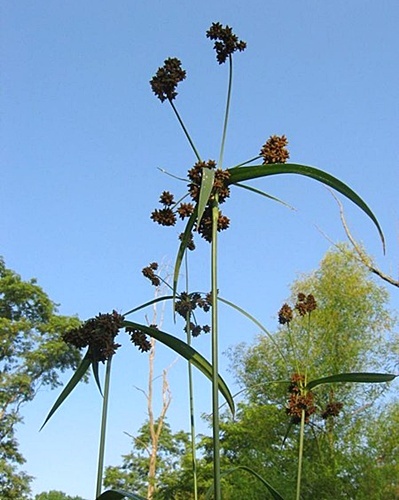 shoots and lower stalk are edible raw. growing tips of rhizome are edible raw. dried rhizome can be crushed to remove fibers, ground into flour. fresh rhizomes can be boiled into gruel. The gruel can either be dried and ground into flour or used wet in pancakes/breads. young rhizomes can be crushed and boiled to make sweet syrup. pollen can be pressed into cakes and baked or mixed with other flours. seeds are edible raw or parched. seeds can be ground into meal. sweet dried sap that exudes from the stem can be rolled into balls for storage. varieties in Ontario are Hard-stemmed bullrush (Schoenoplectus acutus) and Soft-stemmed bullrush (Schoenoplectus tabernaemontani). grows in shallow calm water.